Note: You can enter this giveaway one (1) time per e-mail address per day. Deadline is 11:59PM ET 12.29.18. We don’t want to start an argument, but some might say that pre-game tailgating festivities are more important than the game itself. If you want to take your tailgating to the next level, we have what you need. 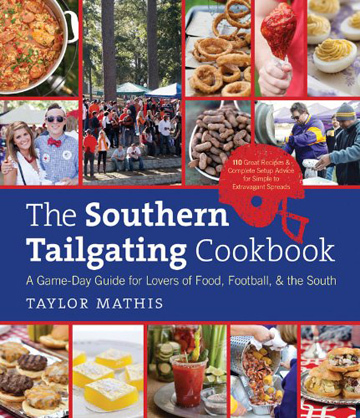 The Southern Tailgating Cookbook features 110 recipes inspired by tailgate traditions across the Southern United States. Everyone is sure to find something to enjoy with recipes that run the gamut from Chicken-Sweet Potato Kabobs to a Zesty Arugula and Kale Salad, to indulgent Deep-Fried Cookie Dough and Mini Funnel Cakes. There’s also information on food safety, packing for a tailgate, checklists and much more. Game on! NO PURCHASE NECESSARY TO ENTER OR WIN. Void where prohibited by law. Open to legal residents of the 50 U.S., D.C. and Canada (excluding Quebec) who are at least eighteen years old at the time of entry and have internet access. Begins on 12.8.18 at 12:00:00 a.m. ET and ends on 12.29.18 at 11:59:59 p.m. ET. To enter this giveaway, submit your full name and email address on this form. Odds of winning this giveaway depend on the total number of eligible entries received. Only one (1) entry per email address per day. Sponsored by Leite’s Culinaria, Inc. For more information, visit our Official Rules. For a list of winners, check out our Very Happy Winners page. Be sure to add giveaways@leitesculinaria.com to ensure notification if you are the winner.